Owning a dog can be hugely rewarding and we are here to help you develop a positive relationship with your dog. Depending on your training goals, we have a range of options to choose from, ranging from puppy training and dog behaviour modification through to competition training. Our team of experienced trainers are here to educate, teach and support you to develop your dog to his or her full potential and achieve great results! The best start in life for your puppy! Social & structured obedience training. Find your dog’s true potential! As long as I can remember, I could be found with a dog and lead in hand. I have had a lifelong interest in the way dogs act, and have constantly wanted to bring the best out of every pet. The trainers at Positive K9 Training are experienced and dedicated to getting great results for you as a dog owner. For the owners, this often includes being educated about how dogs learn, communication principles and developing sound handling skills. For the dogs, this may include obedience training, appropriate stimulation, meeting instinctive goals & providing outlets for drive, appropriate play as well addressing behavioural issues and teaching general manners. Our training plan always varies from dog-to-dog and person-to-person, however we always train with our mission statement in mind. Please reflect on this to ensure your training goals align with this. 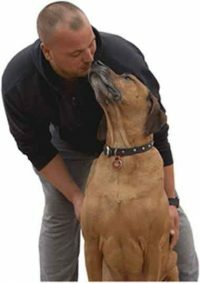 Positive K9 Training was established in 2011 by myself, Chris Loverseed. We had a small team of trainers and intimate group classes. Over the years our team and business has grown to accommodate our increased demand. We have developed over the years to now run group classes, private in home training, competition training for obedience and tracking as well as workshops for our clients. Each member of the team is qualified by the only nationally recognised institution – The National Dog Trainers Federation. All of our trainers follow our set curriculum to ensure consistent education is given to our clients. However, every one of our trainers has their own personal experience, skill set and speciality knowledge to draw from when appropriate. We have staff involved in rescue, dog sports, competition obedience, tracking, flyball, agility, nosework, lure coursing, protection work as well as showing, dog nutrition and conditioning. Although these speciality areas are not necessarily taught at our venue, this additional knowledge can always be drawn from in varying situations. Please see Our Team page to learn more about our team. Our training focuses around several key principles: appropriate management, reliable obedience training, appropriate socialisation and stimulation. Our training is centred around teaching our clients how to train their dogs most effectively and fairly, in order to develop the well rounded pet everyone strives for. Our classes have several levels for puppies and adult dogs with specific exercises introduced at the beginning and built on incrementally at each level. We have found this to be the most successful way of progressing our client’s training, as they are always in a class suited to their level and there are no set time frames. Our trainers all teach the various exercises, following a set curriculum to ensure consistency and clarity for our clients. Depending on your ultimate goal, we have several training options to choose from. If you have a brand new puppy and are looking to setting them off on the best foot, an in-home consultation to cover toilet training, mouthing/nipping, separation, socialisation and the basics of obedience training, can help you feel prepared and with a clear plan going forward. From here, regular Puppy Classes are essential to ensure your obedience training progresses, whilst your puppy learns how to appropriately greet and behave around other dogs and people. This also provides you with the opportunity for ongoing support from our trainers. Please refer to our Puppies tab for further information. If you are aiming to improve your existing dog’s obedience, behaviour and quality of life, an initial in-home consult, follow-up consults then obedience classes may be recommended. Often when behavioural issues present, there can be a multitude of causes and therefore various recommendations to amend these. Teaching the dog new alternative behaviours, clearly showing him what is expected, giving him clear feedback for the behaviour he chooses to display, developing impulse control are some principles that may need to be addressed. Often the undesirable behaviours that dogs display becomes self-rewarding and sometimes habitual, therefore teaching our clients dog’s the above principles is best done at the home environment first and then progressed over further consults. Once the client has sound handling skills, knowledge and safe control of their dogs we welcome you to group classes to proof the dogs learning and improve reliability. Please refer to our Dogs tab for further information on our training packages to choose from. Our trainers will be able to guide you as to which is best suited to your individual circumstances. Dogs under 6 months are welcome to attend group classes without an in-home consult beforehand. Dog’s over 6 months are required to first have an in-home consultation for the above reasons. Once attending classes, if you feel you need further one-on-one assistance you have the option of having further follow-up consults with your trainer, or to have a 45min private session at our training venue in Kew after class with a trainer of your choice. Our competition training options vary depending on your training goal. These are run solely by myself, Chris, and the packages are outlined in our Competition tab. The initial consult first outlines the basic theory, as well as an assessment of your dog and his suitability for your chosen sport and an introduction into teaching the various exercises. From here regular one-on-one training sessions will be organised and then the opportunity to train in our competition team, to practice your skills with the support and presence of others and their dogs. Dog’s are still worked individually here, however there is the opportunity to use people and dog’s as distractions in a controlled setting whilst maintaining the one-on-one support and guidance needed to develop a sound competition dog. Let’s help your dog be awesome! We’re looking forward to helping you train your dog. Give us a call on 0403 727 981 or fill out the form below and we’ll contact you shortly. Each member of the team is qualified by the only nationally recognised institution – The National Dog Trainers Federation. All of our trainers follow our set curriculum to ensure consistent education is given to our clients. However, every one of our trainers has their own personal experience, skill set and speciality knowledge to draw from when appropriate. We have staff involved in rescue, dog sports, competition obedience, tracking, flyball, agility, nosework, lure coursing, protection work as well as showing, dog nutrition and conditioning. Although these speciality areas are not necessarily taught at our venue, this additional knowledge can always be drawn from in varying situations. Please see Our Team page for more information on each of our trainers. Depending on your ultimate goal, we have several training options to choose from. If you have a brand new puppy and are looking to setting them off on the best foot, our 5 Star Puppy Package covers toilet training, mouthing/nipping, separation, socialisation and the basics of obedience training, can help you feel prepared and with a clear plan going forward. From here, regular Positive Puppy School classes are essential to ensure your obedience training progresses, whilst your puppy learns how to appropriately greet and behave around other dogs and people. This also provides you with the opportunity for ongoing support from our trainers. You can find out more about our puppy training packages on the page 5 Star Puppy Package and Positive Puppy School under the Puppies tab. If you are aiming to improve your dog’s obedience, behaviour and quality of life, an initial in-home dog training consult, follow-up consults then obedience classes may be recommended. Often when behavioural issues present, there can be a multitude of causes and therefore various recommendations to amend these. Our competition training options vary depending on your training goals. These are run by Chris Loverseed and Ebony Aitken and the packages are outlined in our Competition tab. The initial consult first outlines the basic theory, as well as an assessment of your dog and his suitability for your chosen sport and an introduction into teaching the various exercises. From here regular one-on-one training sessions will be organised and then the opportunity to train in our competition team, to practice your skills with the support and presence of others and their dogs. Dog’s are still worked individually here, however there is the opportunity to use people and dog’s as distractions in a controlled setting whilst maintaining the one-on-one support and guidance needed to develop a sound competition dog. Visit our Competition Training page for more information. Feel free to have a look through our website, follow us on Facebook and Instagram to learn more about us. Alternatively send an enquiry through our contact form and one of the team will be in contact shortly.